In 1898, the Puget Sound Power & Light Company built a hydroelectric generating plant at the falls that has remained in operation for over a century. By blasting the face of the falls and excavating an underground cavern, the utility company channeled water through pipes to turbines at the base of the falls. The first power plant was completed in 1899, a second was added below the falls in 1957. Today, the renamed Puget Sound Energy diverts 93% of the river into its generators, and this tremendous amount of water has reduced the once majestic flow and mist to a trickling fraction of its former grandeur. The turbines provide less than one percent of the energy distributed by Puget Sound Energy. In 1989, the company filed an application with the Federal Energy Regulatory Commission (FERC) to renew its license for 40 years, increase its diversion of water from the falls and build new generating turbines. The extra power would serve an additional 7,500 customers. The request offended the Snoqualmie people who were already unhappy about the sacrilegious operation and the fact that the power company, developers, tourists, and federal officials have consistently disregarded the spiritual and cultural significance of the falls to the tribe. They approached the Church Council of Greater Seattle which, in 1987, issued a letter of apology recognizing the Christian Church’s “longstanding participation in the destruction of Native American spiritual practices.” The churches pledged to support Native Americans in their attempt to preserve and reclaim their sacred places. Together, the Snoqualmie, the Church Council, and other citizens and religious groups formed the Snoqualmie Falls Preservation Project (SFPP) and began an activist/educational campaign to preserve Snoqualmie Falls in as natural a state as possible. The SFPP proposed the decommissioning of the hydroelectric power plant and envisioned a Spirit of the Falls Sanctuary Park that would be co-managed by the tribe. FERC rejected this proposal. A new threat surfaced in the 1990s: the Falls Crossing Project. The Weyerhauser and Puget Western corporations proposed an enormous real estate development, including a 182-acre housing, retail and office complex adjacent to the falls. The city was going to rubber stamp the project until native activists began attending meetings, asking questions and voicing opposition. The SFPP began an intensive campaign to educate FERC, Congress, the 1.5 million people who visit the falls each year, and the general public in the state of Washington about the impact the proposed development would have on the falls. The Cascade Land Conservancy, King County and the City of Snoqualmie eventually joined in the Snoqualmie Preservation Initiative and in the negotiations to scale back the development project. The Snoqualmie Preservation Initiative also focused on broader development and conservation issues crucial to ensuring protection of the Falls and the surrounding area. 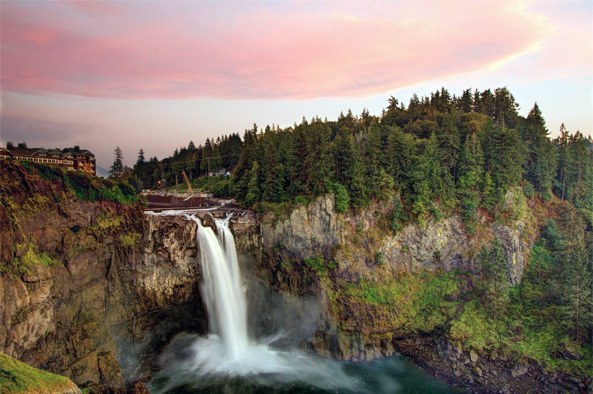 The Weyerhauser Real Estate Company (WRECO), which owned most of the land in the area, was asked to negotiate to preserve Snoqualmie Falls and the surrounding valley. Measures were considered that would appeal to the interests of businesses, environmentalists and native people, and that would create a blueprint for future planning. In January 2001, the Cascade Land Conservancy, funded by the city and county, purchased 145 acres of land near the Falls from Puget Western, Inc., owners of the Falls Crossing site. In March 2001, the Metropolitan King County Council unanimously approved the Snoqualmie Preservation Initiative, an agreement that would permanently protect the Falls, the watershed and the immediate area, and prohibit development on 9,000 acres of forest around the Falls. The county and city have three more payments to make on the Falls Crossing site before this critical piece of land is owned by the public and protected from development forever. The area affected by the Snoqualmie Preservation Protection Initiative has been preserved, but the Initiative has yet to be fully implemented. WRECO will give up development rights to 3,450 acres of forest land near Snoqualmie Falls, but two parcels of land still need to be officially made off-limits to development. The Snoqualmie tribe still does not have co-management agreement they seek. Ironically, in spite of this progress, the Army Corps of Engineers is proceeding with a flood relief program for the town of Snoqualmie and has been blasting away a rock ledge just above the falls. The large rock is 100 feet from the lip of the falls and is a traditional ceremonial site for the Snoqualmie people. The Snoqualmie Falls Preservation Project tried to negotiate a delay, but the Corps has already destroyed down to the water line. In July 2004, the FERC approved Puget Sound Energy’s application for an increase in water diversion and renewal of its lease for 40 years. The tribe is currently fighting for a second hearing and native activists, with the help of the Western Environmental Law Center, vow to fight to the end. Snoqualmie Falls and the surrounding area have been severely impacted by Puget Sound Energy’s hydroelectric plant, and by the millions of visitors who are drawn to the site. By bringing together business leaders, environmental organizations, churches, municipal governments and tribal leaders—everyone who had the power to effect change—and by emphasizing public education over the long term, an agreement was reached to limit residential and commercial development and ensure better protection of the sacred site. The ultimate goal should be removal of the generating station, the relocation of tourist facilities away from the falls, the restoration the area to its natural state, and co-management of the falls by the Snoqualmie people. Cascade Land Conservancy’s page on the Snoqualmie Preservation Initiative. King County’s Office of Regional Planning page on the Snoqualmie Preservation Initiative.